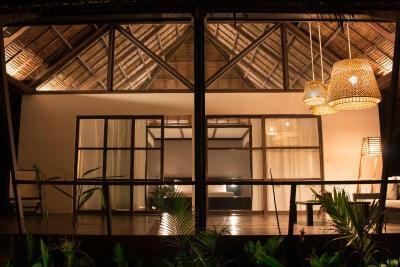 Lock in a great price for Kalinaw Resort – rated 9 by recent guests! 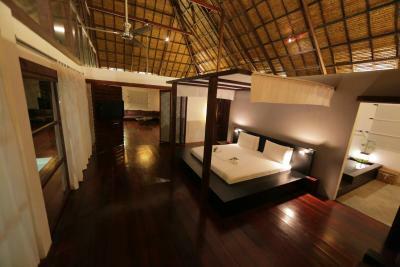 Big rooms (100 sq meters and a 20 sqm bathroom!) and the garden was exquisitely manicured. Pool is small but clean. 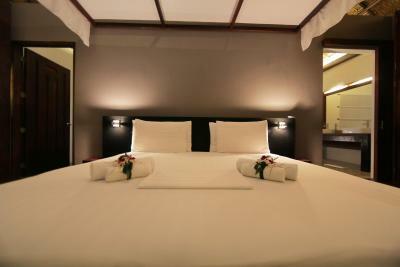 Bed is comfortable to sleep on and aircon is functioning well. Quiet and very private. Spacious, big comfy bed. Everything about the room. Nice place. Very attentive , competent staff. Very good restaurant that changed its specials menu everyday, Excellent breakfast - more than I could have wished for. We had our own negative edge pool which was a delight. Cleaned every morning. 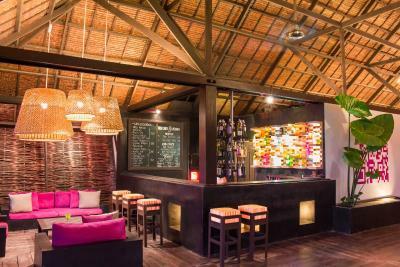 Long beachfront, nice looking design although functionality does suffer from that,, staff was friendly, nice ocean views. 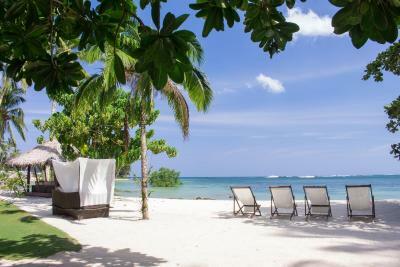 Nice if you are a couple looking for seclusion and quiet. Not recommended to share room with others that you don't want to hear you in the toilet with amplified echoes of your activities. Breakfast did not vary at all during my 4 day stay. Due to poor connections in Manilla we missed on our connections to Siargao. Despite explaining the situation, the manager did not seem to give any consideration to our situation. 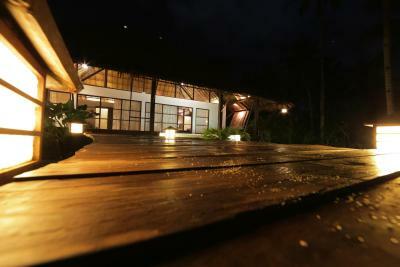 The verandas are beautifully lit in the evening and grounds of the villas are well kept. However, the wardrobe doors do not shut well, if you are not careful you may injure your head, which happened in our case. I love the healthy breakfast. My kids loved the pizza, and the pool. 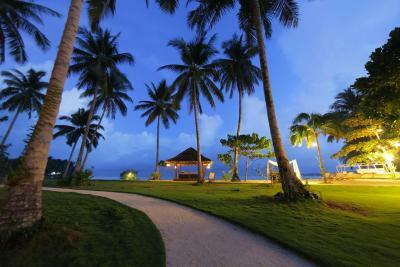 We enjoyed the resort-- facilities, the comfort of our villa. I find it safe and secured for me & my kids. 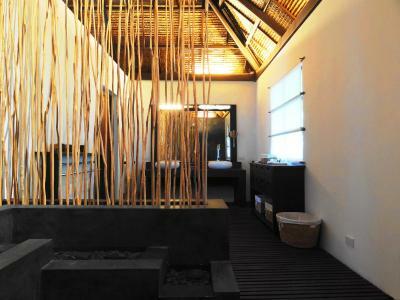 Perfect for when you want to rest and recuperate with your love ones. The villa’s architecture and interior is wonderful. 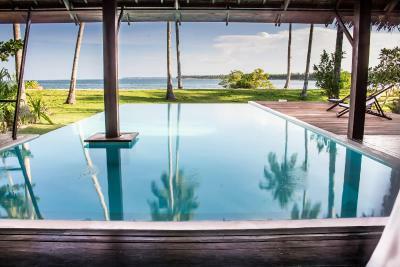 The villas are very exclusive and private and that’s what we really wanted. They have excellent service. One morning we were going to surf at 5am and they prepared breakfast for us the night before so we could have packed breakfast in the morning. 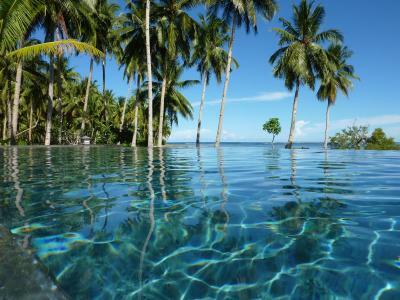 I would definitely go back here in this resort. Stunning property. Staff were super helpful in organizing all activities. 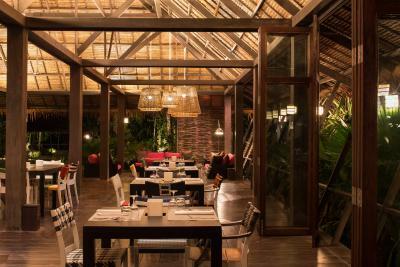 Kalinaw Resort This rating is a reflection of how the property compares to the industry standard when it comes to price, facilities and services available. It's based on a self-evaluation by the property. Use this rating to help choose your stay! 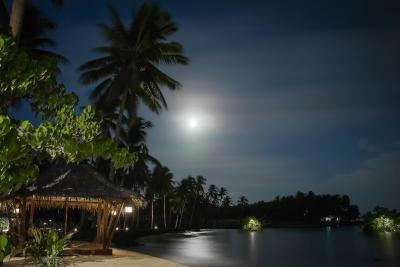 Set in a remote area in General Luna within Siargao Island, Kalinaw Resort features a private beach area, an outdoor infinity pool, a restaurant. 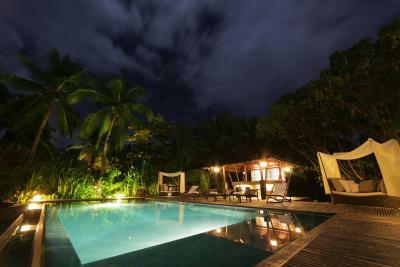 The resort is 2,650 feet from the renowned Cloud 9 surf spot, offering free WiFi access throughout the property. 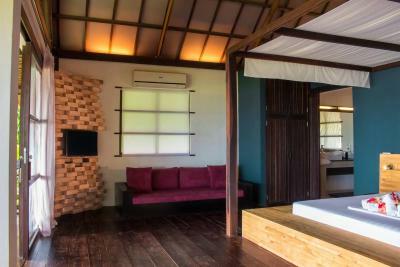 The expansive villas and suites at Kalinaw Resort feature a flat-screen TV with satellite channels and an iPod docking station. 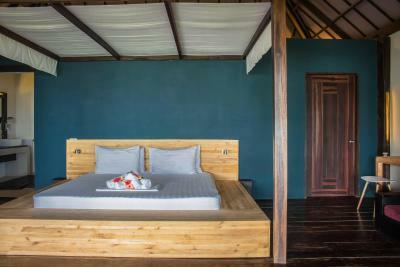 The rooms feature a sofa seating area where guests can relax. 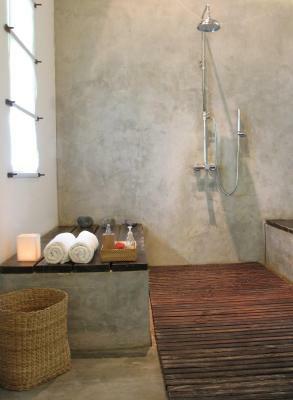 The private bathrooms come with a rain shower and free toiletries while some units are fitted with its own pool offering views of the sea. Other in-room amenities include a safety deposit box and a mini-bar. 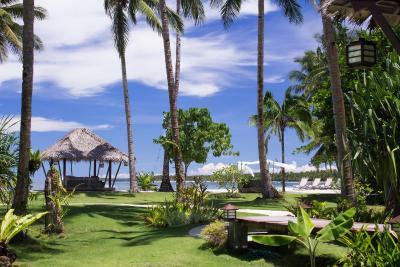 At Kalinaw Resort, guests can engage in an array of activities such as canoeing, surfing, snorkeling and diving. 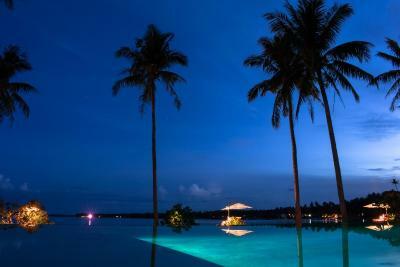 The outdoor swimming pool offers panoramic views of the sea while bicycle rental is available and the garden area provides a relaxing setting for an afternoon stroll with views of the beach. The property offers babysitting and laundry services. Airport transfers and shuttle services can also be arranged upon request, at additional charges. 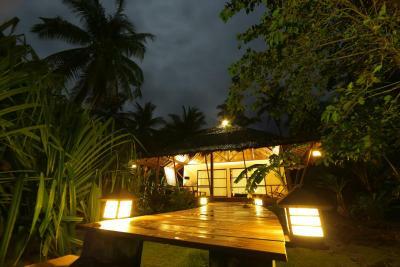 The resort is an hour drive to Magpupungko Tidal Pools and the nearest airport is Sayak Airport, 19 mi from the property. 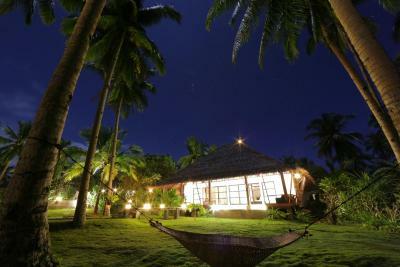 When would you like to stay at Kalinaw Resort? 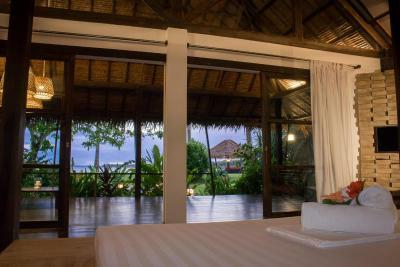 Set facing the lagoon, this free-standing villa features a private terrace with sofa seating area, a flat-screen TV with satellite channels, and a refrigerator along with a mini-bar. 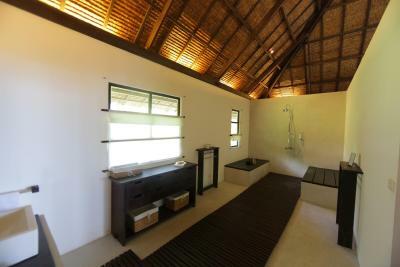 The spacious private bathroom comes with rainwater shower facility, free toiletries, and a separate toilet. 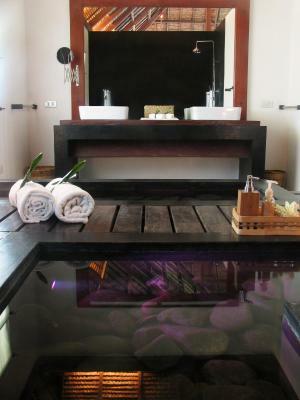 Tucked away in a hidden part of the resort, this private suite features its own pool along with a spacious terrace. 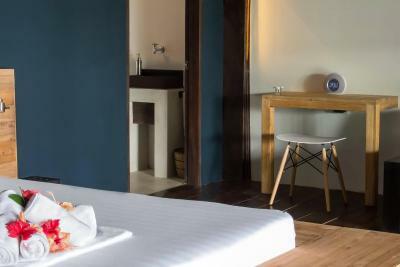 The air-conditioned suite is fitted with a king bed, a 42" flat-screen TV with satellite channels, and a mini-bar. 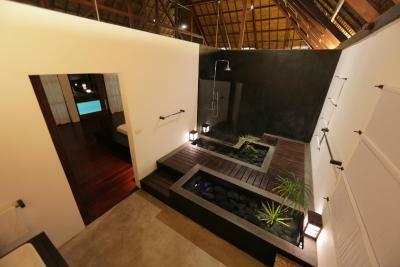 It also comes with a private bathroom with rain shower and free toiletries. 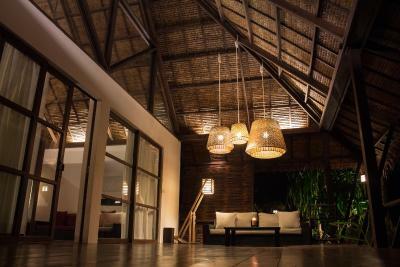 House Rules Kalinaw Resort takes special requests – add in the next step! The bed was difficult to get in and get out from because of the wide frame. You have to climb up to it and for old people it is quite a task. There was no bath tub in such a big bathroom. It’s jot practical that you have to go around the room to get from the bathroom to the toilet. Usually after using the toilet in the morning you go on a take a shower. Two sofas are not practical. It needs more space to store clothes. They don’t allow you to bring your own food or drinks but the food service is not 24/7 a they close at 10 pm and start serving only at 7 am. Between 2 pm and dinner time you cannot order pizza. Food is over-rated, too expensive but the amount and taste is not worth the price. During our stay the beer from the red is stale (which I returned and refunded), the cable didn’t work (and the TV is small for such a large room) and the sink had a leak and caused a flood in the toilet. The toilet seats need a good scrubbing under the seat where you don’t see from above. The kettle didn’t open and broke when we tried to pry it open. 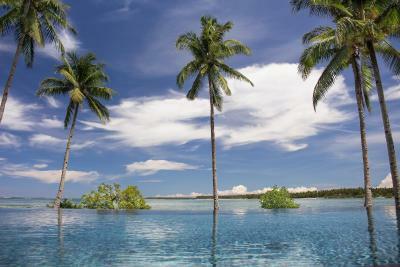 The place has potential to be great but still needs a lot of improvements to be called a luxury destination. The beach is not swimmable and the location is far from the hub of usual gathering places. Community swimming pool sides & steps were roughly cemented. It would’ve been great if the pool was tiled. We’d come from a hotel in Boracay called Coast which is probably a shame for these guys because they had massive shoes to fill. The service we experienced there was unbelievable and the hotel was half the price. 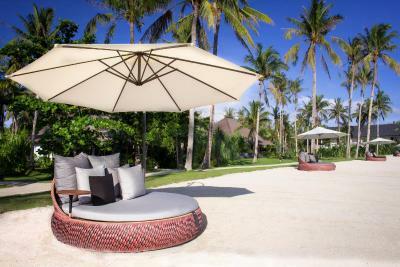 Every hotel should take a leaf out of Coast’s book because they just nail it - if you go to Boracay don’t stay anywhere else. 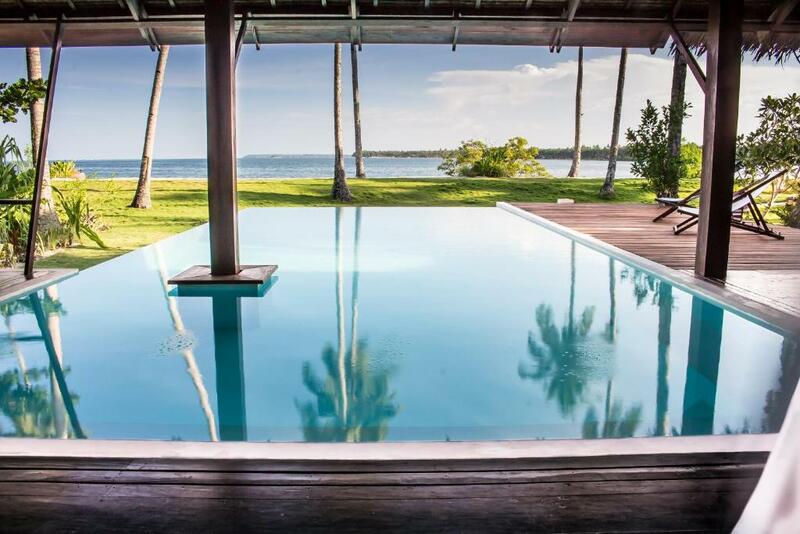 But with the experience at Coast aside, you are literally just paying for a beautiful villa, and for the price tag in somewhere like the Philippines, it really needs to be much more than that. One night at Kalinaw is the equivalent of how much we spent on food, drink and activities for two people in a week in the Philippines. And we weren’t holding back on anything or budgeting the trip at all. That’s how cheap the Philippines is and so my expectations around service and experience at Kalinaw were high as it is an expensive place to stay and was an anniversary present to my partner. Little things that a luxury hotel should have sorted weren’t - for example there were no towels at the pool and the staff just told us ‘no towels’ and so we had to go find some from another staff member. There was no one at the pool bar and no drinks there so we had to get our own drinks if we wanted any from the main restaurant, there were only a couple of channels on TV (no Netflix or Foxtel for movies) which would have come in handy because it was raining the whole trip so we were inside a lot, and we just didn’t really have much to do with the staff at all which is usually what we love the most when we’re on holiday. They mostly kept to themselves, didn’t offer any service and the staff at the restaurant just stood around bored all day and didn’t seem happy, with one or two exceptions. I wouldn’t come back again and to be honest was pretty disappointed and feel a little ripped off. 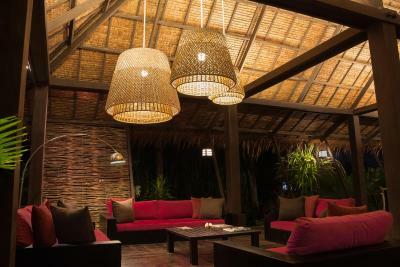 The villas were amazing - they were huge, private, beautifully designed - the best part about the stay. Couldn’t fault the villa. The location was good but was a little far down from the main cafes and bars so we got a scooter to drive around easily. The beach in front of the resort is not really swimmable but still a beautiful view to wake up to. Breakfast included was good. Poor wifi. Asked helped to get connected to the internet but no one came. Rocky beach. Nothing. Everything was grate! I’m just sad I missed a whole day due to my flight delay. The staff was AMAZING!!! Len Len and Twiggy were so helpful and kind. They went above and beyond to make out stay special. The tour packages and rentals they provided for us were convenient and pricing was very reasonable. To my surprise I actually Booked a private island tour and Len Len, one of the staff members came with us and cooked our meal for the day. She also arranged our ride back to the port so we catch our boat out. Her husband came and picked us up at 3:00 in the morning to take us. I’m glad she went out of her way to make sure we had a secure ride back. She also cam with us to see us off. Twiggy stayed in contact with me via email before my vacation even started. She answered all my questions right away. We had flight delay to the island and missed a whole day at the resort. I let her know what happened and she told me what to do, where to go, what time to be there and how much it should cost. I felt she was with me every step of the way. When your in another country its great to have grate advice and help if needed. Thank you girls!!! This was such a special trip and I know I will be back. General Luna was such a special town. The property was more design and less functionality. We had the largest and most expensive room at the resort. The walls do not go to the ceiling and everyone can hear everything. I mean everything! Sounds echo. Whispering and toilet breaks included. The room advertised that it would hold 6 people but they will not provide a full bedding package for more than 4. Specifically they won't provide a blanket. Sheets and pillow were provided. Asked staff multiple times, four times we were told it would be taken care of and finally one told us it was against policy to have blankets on those beds. (Not temporary add on beds by the way) Finally, one about half of the days they didn't provide enough towels. Two towels for five people for example. They did bring the rest when we asked though. Overpriced when compared to other resorts is my final observation. I will not go back. 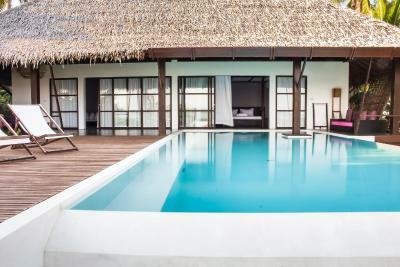 Lack of attention to details on a 5 villa resort. The choice of bfast is very limited. It’s akready boring on the third day as there is not much variety offered. Not really their fault but beach isn’t great. Lots of beaches close by tho.